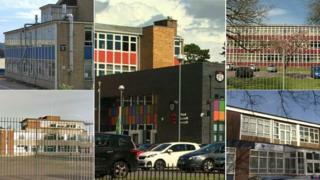 Five Cardiff secondary schools are to be rebuilt or expanded as part of £284m improvement plans. Cantonian, Fitzalan and Willows high schools will see their buildings completely replaced. Cardiff High in Cyncoed - which is one of Wales' most oversubscribed schools - is to expand places by a quarter. Cathays High School will also be rebuilt as part of detailed plans unveiled by Cardiff council and called "the biggest Cardiff has ever seen". Three primary schools - Ysgol Gymraeg Nant Caerau, Fairwater and Ysgol Pen y Pil in Trowbridge - will double in size, while St Mary the Virgin, Butetown, will be rebuilt, doubling its size. This is the second phase of the city's 21st Century Schools programme, jointly funded with the Welsh Government, and is intended to meet demand as the Welsh capital's population continues to grow. Three secondary schools for city? Cabinet member for education Councillor Sarah Merry said: "Not only will our next round of investment allow us to continue to renew our schools, replacing those that are reaching the end of their operational life, but it will also enable us to provide more school places across all sectors." Cardiff High has been a successful school under pressure, regularly having at least twice as many pupils disappointed each year as those who successfully manage to get places. Its expansion will see 300 extra places created to take the school capacity up to 1,500 pupils. Altogether, eight new forms of entry will be created at the five secondary schools involved. The proposals will be discussed by Cardiff council's cabinet next Thursday.